If a restaurant in your neighborhood was temporarily closed because it made people sick, wouldn't you want to know? The health department told the NBC Connecticut Troubleshooters has no right to that information. "It was one of the worst experiences I have ever dealt with in my life," said Kamran Niazi, recalling the effects of three slices of chicken pizza from Oregano Joe's on Boston Post Road in Orange. “I had 104-degree fever, diarrhea – extreme diarrhea – extreme vomiting. Niazi said an ambulance took him to Yale-New Haven Hospital, where he spent almost a week in the Intensive Care Unit. “The first couple of days, they were extremely worried,” he explained. Niazi said doctors told him he had a bad case of salmonella, and he wasn't alone. “One of the doctors actually told me there was one other person in the hospital who ate at the same place, Oregano Joe's, and he was in very bad condition as well," Niazi said. But when he was released from the hospital, Niazi couldn't get any information on his case from the Orange Health Department, even though inspectors had called him with questions while he was hospitalized. Now Niazi and his attorney, Jose Rojas, are suing Oregano Joe's for $15,000 to cover Niazi's hospital bills. “We're just trying to figure out what happened," Rojas said. But they can't. Rojas and Niazi have taken the Orange Health Department and the state Department of Public Health to court in an effort to glean more information. “We know salmonella was involved, but we don't know why salmonella was in the restaurant. We don't know how it got into his food," Rojas explained. The Orange Health Department and the state DPH cite several statutes that they said forbid them from speaking with the Troubleshooters about any information in a food-borne illness case. “For the victim of infectious disease caused at a restaurant to not have a right to know the details of what his department of public health discovered relative to his own illness is frankly an outrage," Rojas said. The Orange Health Department told the Troubleshooters it has ordered Oregano Joe's to close down twice, once for a day on May 30 and then again on June 20 for a span of five weeks. But the department won't say why. "The public health department is supposed to help us. I think it's a disaster," said John Tomas, a law professor at Quinnipiac University. Thomas said what the Orange Health Department is doing isn’t serving anybody. “I think it's absolutely, completely wrong. The government statute does mandate privacy and confidentiality for records, but only records that the health department obtains in a study designed to reduce mortality and morbidity, that is death and illness in a particular setting, and this is not that kind of study," he said. Some information is available on the Oregano Joe's closings, but not from the health department. When the restaurant owner needed to get inside during one of the closures, police had to let him in. Court papers from Niazi's case against the health department indicate Oregano Joe’s was served with a violation for “falsified employee stool samples” during one of its investigations this year. Rojas said that if health agencies are just obeying Connecticut law, the law may need to change. “If you want to interpret that in the broadest sense, it would pretty much would apply to every single thing the Department of Public Health would do," he said. "In other words, it would arguably cloak any activity that they're involved with." 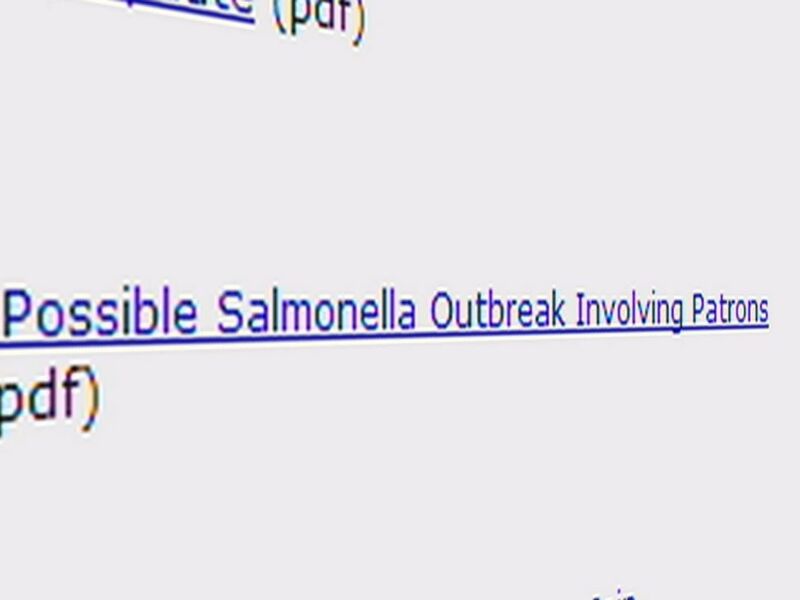 In fact, in 2006, state health officials did notify the public about a salmonella outbreak at a Canton restaurant that sickened roughly two dozen people. Niazi believes the failure of the Orange Health Department to share any information on his case may have kept inspectors from learning the full extent of the salmonella outbreak that got him sick. “What's the point of having a public health department that's not protecting the public's health and is actually hiding and withholding information from the public?" he wondered. The NBC Connecticut Troubleshooters have filed a complaint with the Freedom of Information Commission against the Orange Health Department for failing to disclose basic information on the nature of the Oregano Joe's closings and the number of people who may have become ill like Niazi.